Yazoo Mfg Company, founded in the mid 40’s, made several commercial duty mowers, from a heavy duty walk-behind model called the “Big Wheel”, to the 3 wheeled Master Mower, sometimes called the Yazoo Rider. Yazoo built the 3 wheeled riding mowers from sometime in the 60’s into the 80’s in a factory in Jackson, Mississippi. The 3 wheeled Master Mower design came in a variety of power plants, with mowing decks ranging from 36″ up to a massive 76″. The model number also designates, the mower deck size. For example: YR-36, YR-42, YR-48, YR-60, and YR-76. Later on the Yazoo company was merged with Kees, becoming Yazoo / Kees where they eventually made zero turn mowers much like the hydraulic transmission ones that are available today. I purchased the Yazoo Master Mower at a government liquidation auction. It is a commercial duty mower with a unique 3 wheeled design. Mine has the 76″ mower deck and a 23 HP Kohler engine, with the manual transmission. My Yazoo mower was placed up for auction by the County maintenance dept. because they had just broken a axle shaft, and although they fixed it, they decided replacement parts were becoming too hard to find. The employee I spoke with was the primary user, and was sad to see it go. He preferred it to their newer commercial zero turn that replaced it. 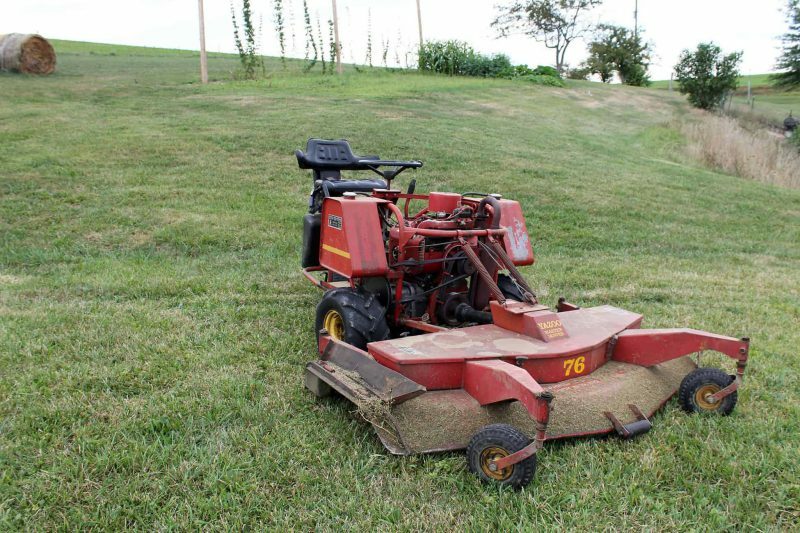 The 76″ mower deck makes quick work of the hilly 4 acres that we mow with it. It takes some getting used to, but once you are familiar, it can hug directly around a tree and I can mow my four acres with nearly zero trimming afterwords. The blades seem to cut right up to the edges of the mower deck better than any other mower I have used. The only exception on my property is one gated off section where the mower will not fit through the gate. I plan to eventually get an 8′ gate to replace the current one at that location. At first, the mower did struggle with many of the slopes on our property. I switched the turf style tires out for the ag-style Carlisle Super Lug tire (18×9.50-8), and it was able to climb most of the slopes we needed to mow, many of them well past the 15 degree limitation that Yazoo states. The steepest sections I can still only mow downhill, so I do need to plan the pattern accordingly. I have unfortunately already broken an axle shaft (the same one that the previous owners had replaced), as well as the wheel hub on the same side. The axle shaft twisted and snapped at the splines. since it was a custom made replacement part, I wonder if the heat treat process was done. I welded the hub back together, and purchased a replacement axle shaft from Wagoner Power Equipment out of Ohio. what model, what condition, and how close to southern Illinois? Bernadette, where are you located? I’m interested. I have a yazoo 76 inch for sale. what condition, what model, and how close to southern Illinois? I am looking for a Yazoo YR60 or wider mower. Can you all suggest some suppliers for parts? Would you possibly have any pics you can share? I used a Yazoo 60″ in commercial work for several years. It was a great mower with an 18 horse Wisconsin engine. I am now trying to get my old Gravely Convertible Tractor up and running for my own use and amusement: another great machine. Would you be interested in a 16 hp Gravely ( not running ) w/ deck ? Located in east -central Indiana. Where did you manage to find new clutches? I have a 1972 Yr60 and I’ve been toying with the idea of a total overhaul. My only hang up has been axles and clutches. any yazoo mower with a pto to drive the deck is not a YR series. I worked for the yazoo distributor in Indiana in parts. everybody wants to call all of them yr. YR’s had a 16 hp briggs, a 12 hp agnd wisc, or a 18 hp tjd wisc engine. Kohlers came out on the models that had the pto to drive the deck. if it has the pto and throws grass to the left that is a psg model deck. if it has the pto and trows grass to the right that is the psr deck. a YR will have 2 belts that go down and make a 90 degree turn to run the deck. Does anyone have a Yazoo Big Wheel for sale? Are you still looking for a yazoo big wheel? I’m considering selling a sr26 with the Briggs 8.5 ic engine. In good shape. Located in Jackson Ms. I would love to have it! One problem. I’m in North Carolina. Any ideas? Do you still have your YR60? I used to have one and I’m very interested. Where is Freeburg? I’m Roger and I live near Little Rock. Could you text me a photo to 501-517-8346 or e-mail to lacmusa@yahoo.com? Do you still have the Yazoo for sale? I am in NASHVILLE and can easily come pick it up. I have a yazoo yr 60. Have had 10 years now. Fun to use but does not have breaks. I am trying to find parts. It does not look the greatest but would like to fix. Up. 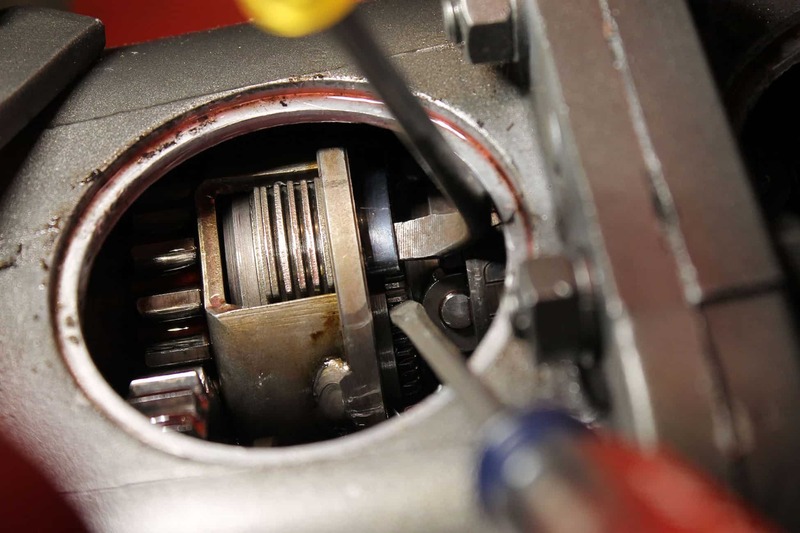 Has Wisconsin motor with magneto. I need a mower deck suspension spring for a Yazoo YR-60 or a PTO KM23. Please let me know if you know where I might find one. Does anyone know for how long Yazoo manufactured these Master/YR models? 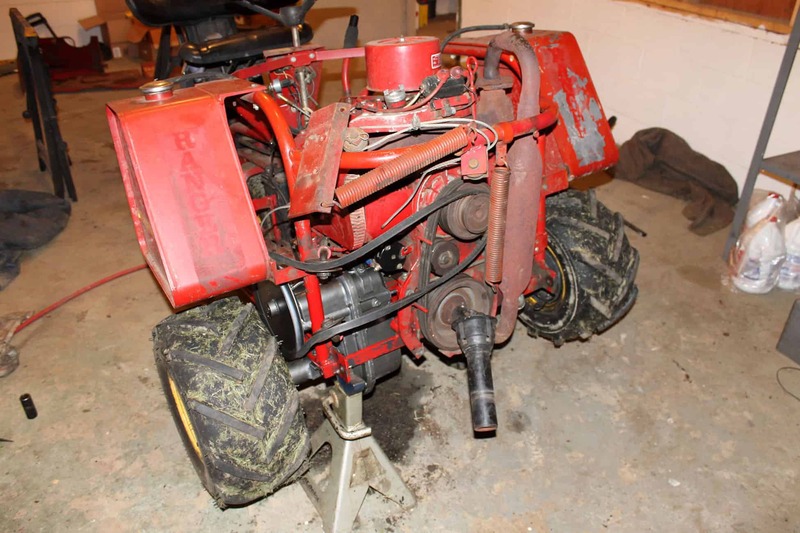 DOES ANYBODY KNOW HOW I CAN GET A PARTS & REPAIR MANUAL FOR MY YAZOO ” BIG WHEEL ” WALK BEHIND MOWER ??? 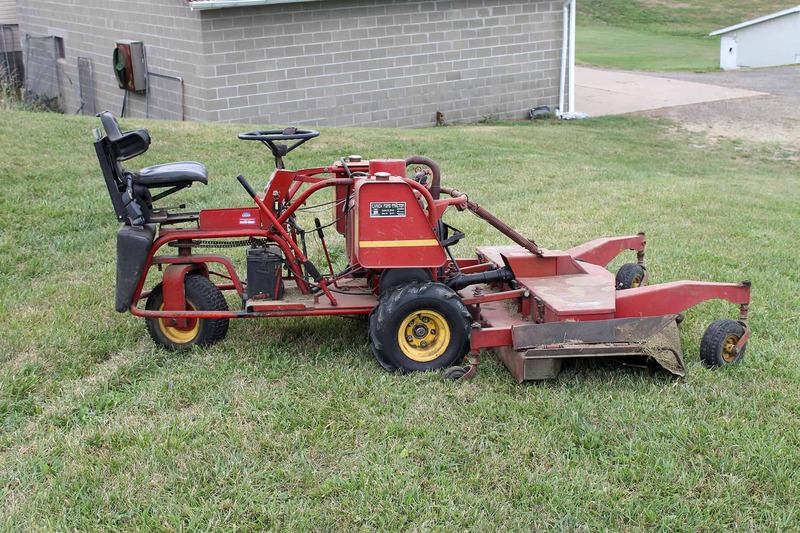 I have a Yazoo Master Mower w/ 60″ deck, part #42-PSR60. I was wondering what fluid I needed to put in the pto unit on the deck? Thanks for any help anyone can give. I have a Yazoo 20 horse 60 inch mower in Southern Illinois for sale. I have a mid-1970’s YR48 that has a 60-inch deck, 9 horsepower Wisconsin engine. Has been in shed and not used for 10 years. Ran when put in shed. Tires are flat. I have pictures available. Location is St. Louis, MO. Any one out there know someone in the UK who might be interested in a Yazoo mower? I have a Yazoo Master Mower with a 48 inch deck and a 500cc Briggs and Stratton engine. I have a Yazoo mower with a 60″ deck it uses a PTO so I think that makes it a psg. 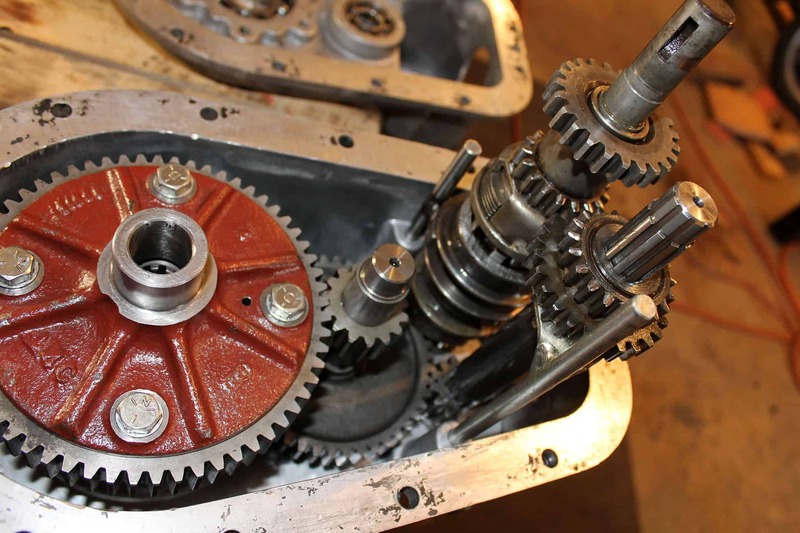 I am looking for a manual that describes the angle drive – the one I have was taken apart to replace bearings but not reassembled. Does anyone know where I can get a schematic or pictures? Are you still looking for the blades? We have ten, new old stock, 0206-776 blades in stock. We also have a wide variety of new old stock Yazoo parts. Yazoo Riders were great: well-made. People are waking up and wanting them again, so don’t junk one without asking around. I am looking for one now in North Louisiana. I have for sale a Yazoo 60 inch mower, new tires and belts, 2-cylinder Wisconsin engine. Do not need anymore downsizing. I am in Taylorsville, NC. E-mail if interested. Can you send me some photos please? Do you still have the Yazoo YR60? Do you still have the yr60? Hi Ben, I’m interested in your Yazoo if you still have it. What are you asking for it?? Iive in louisburg N C. and I have a big wheel Yazoo mower with the 3.5 Clinton engine if you see anybody looking one. Are these still available ? I’m about 70 miles southwest of you near Pacific Missouri. Thank you. I’m in NC. That would be too far. We just spent 3 hours pulling a Yazoo master mower with a 60 inch deck and a Kohler magnum 20 motor out of the woods in the back of our property. Any info on where to get parts? Or advice on restoring it would be great. In east TN. did you sell your yazoo? I am listing mine. I have the same size you did. Let me know if you know anyone else looking to buy one. Mine works needs a bit of tlc but all good. I found a blade for the S-20 I am restoring; would like to find two NOS rear wheels 20-inch spoked but foubt I ever will. Still looking for a YR to restore, in driving distance of Louisiana. My extraordinary Yazoo psr 60 Kohler ch25s just developed a bent pusher rod suggesting head/valve/piston problems. It has been an incredible mower. Anybody have engine parts or know of a source for parts. Located in Louisiana. May consider sale. We have a 77 that needs a coil. do you know where we can purchase a kit? for a bargain price. Try Jan @ Jadco in Hiwasse, AR. Tell her Nathan Threet told you to call. My parents were distributors for Yazoo for MANY years. She still has a substantial amount of parts. 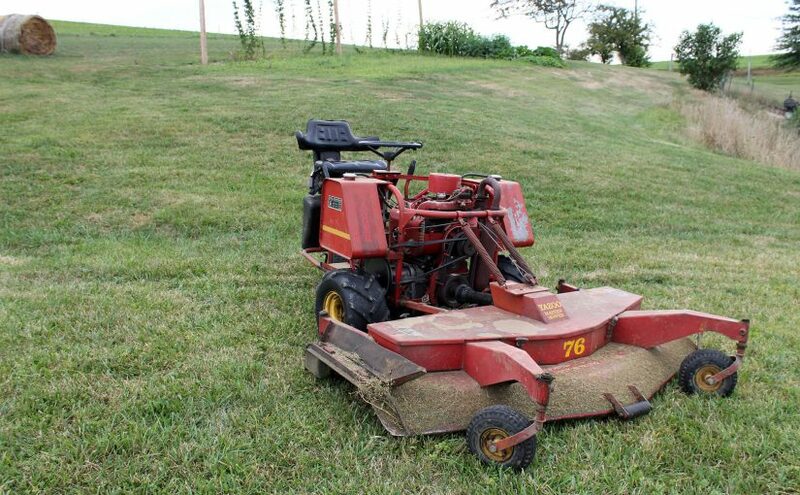 I am looking for a set of mower blades for a PSR-76 Yazoo mower deck (76″). The blades are Yazoo part number 0206-626 or Oregon 91-861 it takes 3 blades for a set. I also have 2 YR60 Yazoo mowers that I do no use anymore. And a extra TJD motor. Also a extra YR60 Trans and frame and deck. If some one needs parts. Harry, Where are you located? Palm Bay Florida 32905 just east of Orlando on the east cost of Florida and Just south of Kennedy Space Center. Thanks Harry, Unfortunately too far for me to travel. HI, anyone have a source for replacement rear wheels for the Yazoo push mowers? I have a 20 inch made about 1982 with the bicycle-type rear wheels and I need two new ones. The wheels on this mower are marked Made in France. They are 16 inch x 2 inch and are rusty. I have the mower restored otherwise. We have one, part # 2302-123 20″ spoke wheel rim assy only, in stock. Feel free to contact us for more information. If you’re looking for other parts too, we have about $70,000 worth of vintage Yazoo parts in stock. Hey this may be a long shot but I’m selling a yazoo mower with what I believe is the 76 inch deck (has a 76 across the front) it is not running. It comes with 3 tires never used I bought a few years back when I was still trying to fix it. It also comes with a box of spare parts(not sure what is in the box). It needs a steering gear worked on(missing a few teeth) and the last time I worked on it, it was running on starting fluid but not sucking fuel from the tanks. Located in northeast oklahoma. If you have questions or would like some pictures you can email me at davidchuning@gmail.com I’m asking $650 OBO. My dad in NE Arkansas has six or seven different Yazoo riding mowers. Most are 60″ I think. He’s modified most over the years with larger twin-cylinder air-cooled engines. He also has a lot of extra parts he acquired over the last several decades. I don’t know the specific model numbers, etc. but would like to start trying to find good homes for these things. Please send me an e-mail. I need transmission parts if you have them. Tom Dillard – This is David Young. Please call me (615) 332-1761. I have a working yazoo model number 31 YR48 16 sn 522768. engine turns over and runs great. needs a seat and some TLC. needs a rear innertube too. any offers out there? I’m in Wisconsin. Would like 450. Runs and mows great! Located in Indiana. Did you sell your TJD Yazoo ? I am in East-Central INDIANA, near RICHMOND, Ind. 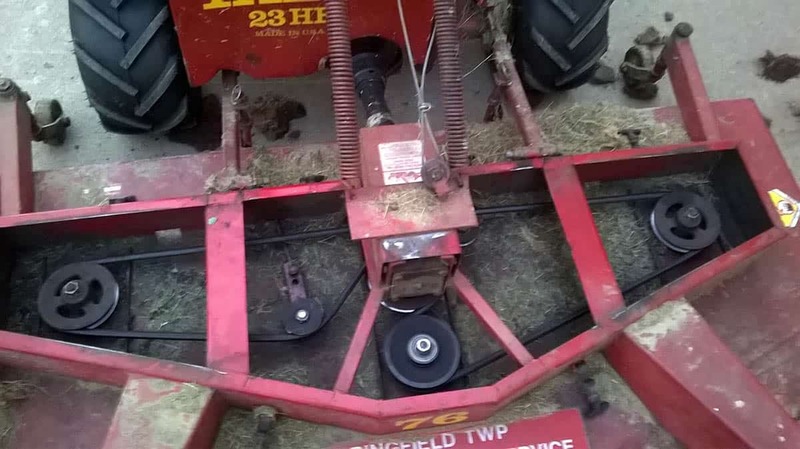 Hi I have a similar problem to the author of the master mower article. I was mowing nicely the other day when I heard a “ting” from the gearbox, then no drive. I think it’s broken a shaft. Once I get it apart would I be able to get part numbers for your supplier in Ohio. Thanks Steve. I am looking for a big wheel Yazoo. I’m in north Louisiana. What size are you looking for? I have a 22″ self propelled. 1 owner. My grandfather and father were distributors for yazoo in the 60’s 70’s and 80’s. This was one of the last ones our store had. I am in NE Texas. It does have the Wisconsin engine. Hey I have a 76 inch cut yazoo with the 20hp Wisconsin, and a box of parts for it, it was running on starting fluid a few years ago but we never got around to fixing it all the way. We really need it gone. Asking 400 but would entertain offers, just need it gone. 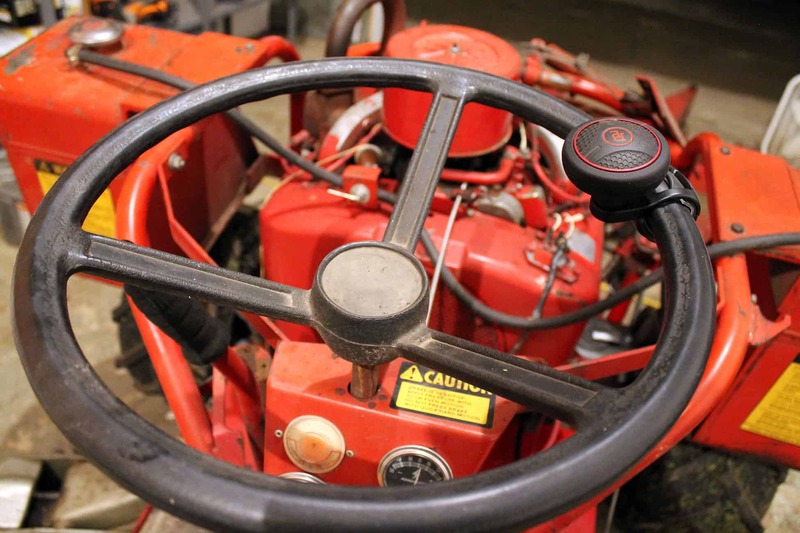 We have a number of older model frames, and six or seven mostly whole mowers, and a number of the twin-cylinder Wisconsin motors. These were all my dad’s mowers. He passed away a few months ago and we want to try and find homes for all this. Here is a link with some pictures of the equipment. It is not complete as there are other mowers I don’t have photos of at this time. If you have any questions you can contact me here and I can attempt to answer your questions. My Dad had multiple Yazoo riding mowers for over 30 years. He passed away this past September. We would like to find homes for them if possible. If you think you are interested in something please contact me. The mowers are located in NE Arkansas. Hi, Tom, I am interested in a complete or nearly complete unit. Where exactly are you? You have a treasure trove of parts there! Randy, mowers are up in NE Arkansas, but unfortunately I’m not. But I have family nearby. I’ve got more photos of stuff to try and get uploaded. Thank you for the interest. Tom – please let me know when you get additional photos uploaded. Leah I have tried contacting you several times; if you were interested in my Dad’s Yazoos we need to figure how to communicate. Thanks! Does anyone know the size of the front deck wheel for a PRS-60? I just bought one without wheels and I need to replace. My tires are bad – weather checked / cracked bad. Do you need the caster & wheel assembly ? A farm store may have tires for you. I live in the Dallas area. We are downsizing and I have a Yazoo YR60 with an 18hp Wisconsin twin. Purchased in ~1975 and it still runs well. This is the original design with the twin mower deck drive belts. I have used it weekly to mow our yard until we moved in early January. I also have a flatbed trailer that goes with it. Need to move it pretty quickly. Free to anyone who wants to come to Dallas to pick it up. 972 742 7758 or halkurkowski@sbcglobal.net. Gave this mower away to a happy new owner in East Texas. I bought a 22″ Yazoo big wheel that was returned for $150 in 1990. Used it for 25 years, sold it for $150. Bullet proof!! Sadly my knees couldn’t keep up with it. I have yazoo YR-60 they both have the 12.5 hp Wisconsin AGND eng. Sitting in Garage for 13 years. Needs work but complete . With new old stock spindle shaft nuts etc. All original books and parts manual etc. Located in Chance Maryland. Call 703-623-0174 calls only please. 100 $ dollars. 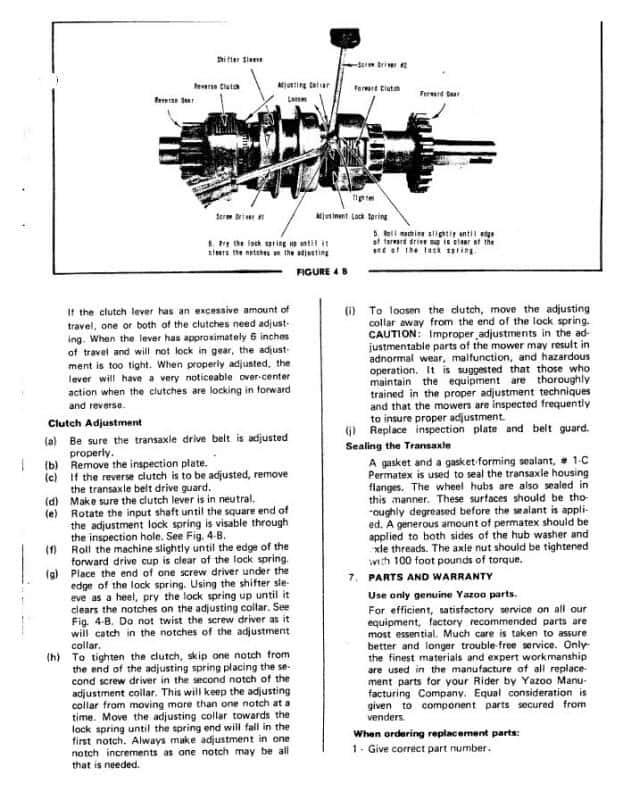 I am looking for Part #0319-014, Cylinder Lift Assembly, for an old Yazoo YTKC25 front cut rider. Mower still runs great but cylinder lost its top vent cap and is leaking when running and really leaking when raising the deck. Any help or suggestions would be appreciated. If I can’t find, will have to sell it for parts. Previous Previous post: Does turning the thermostat down at night really save energy?